Where in Maine does the sun rise first? People gather a few minutes before 7 a.m. Saturday, Oct. 22, 2011, at the summit of Cadillac Mountain in Acadia National Park to see the sun rise. Cadillac Mountain is one of three places in Maine that claim to be where the sun first shines in the United States each day, depending on the time of year. ACADIA NATIONAL PARK, Maine — For the most part, there’s little doubt about what you can see from the top of Cadillac Mountain on a clear and sunny day. The rounded barren peaks of Mount Desert Island and the surrounding Maine coast ring Cadillac in several directions. Island chains such as the Porcupines and the Cranberries dot the waters of Frenchman Bay and the Gulf of Maine. The vast expanse of the Atlantic Ocean stretches away from the nearby shoreline and over the sweeping horizon. But there’s one question about a possible sight from the summit that seems to persist no matter how many millions of people may take in the panoramic view from Acadia’s highest peak. When the sun rises over the horizon each morning, is the top of Cadillac the first patch of soil in the continental United States to directly receive its rays? The issue was fiercely debated toward the end of 1999 as people began making plans for watching the sunrise on Jan. 1, 2000, which was being heralded as the beginning of a new millennium (which some say started a year later). Many declared their intent to ascend Cadillac Mountain to be the first to see the dawn of the 2000s, but at the eastern tip of Washington County, which bills itself as the Sunrise County, the communities of Lubec and Eastport were staking their claims, too. They appealed to the U.S. Naval Observatory for an official determination. Though observatory officials denied manufacturing a compromise, they declared that the sunlight would arrive at the peaks of Cadillac Mountain and at Lubec’s 210-foot tall Porcupine Mountain at the same time, 7:04 a.m., on Jan. 1, 2000. Eastport, which is organized as a city rather than a town, declared it would be the first city in the United States to see the sun that day. Since then, however, the discussion of which locale in Maine is the first to greet the sunrise has included another variable. It depends, officials say, on the time of year. And the competition for bragging rights has evolved into a contest that includes more than just Acadia aficionados and loyalists to the Sunrise County’s cause. Mount Katahdin is not in the the competition, however, according to officials at Baxter State Park. The peak, Maine’s tallest at 5,267 feet, is not in the running for potential first-in-the nation sunrise glory. Mars Hill, on the other hand, is happy to throw its hat in the ring. The Aroostook County town, named after the windmill-topped 1,700-foot-tall mountain that looms over the Canadian border, promotes its claim with its office supplies. Brewer said that though the town’s stationery does not go into such detail, Mars Hill gets the honor for only part of the year. Because the suns slides northward along the horizon during the warmer months, when the North Pole gets sunlight 24 hours a day, the mountain has the advantage over its coastal competitors when it’s warm out, she said. Lubec also holds its sunrise heritage in high esteem, according to Town Administrator John Sutherland. According to news reports, about 500 people gathered at West Quoddy Head, a peninsula in Lubec that is the easternmost part of Maine, to see the Jan. 1, 2000, sunrise (East Quoddy Head is just across the border, on the Canadian island of Campobello). But the Lubec official acknowledged that the town’s claim to being the first to see the sunrise is fleeting. What may look impressive from Mars Hill in the early morning light — namely, Canada — blocks out the first rays of dawn from Lubec in the late fall and much of the winter when the sun migrates south along the horizon, he said. Grand Manan, a New Brunswick island about 15 miles long that has tall cliffs facing Lubec on its western shore, is about six miles southeast of West Quoddy Head. “The sun positions itself behind Grand Manan, and we are not [the first Maine locale to see the sun in winter],” Sutherland said. West Quoddy Head can make this claim around the spring and autumn equinoxes, when the rising sun appears north of Grand Manan but not far enough north that it shines first in Aroostook County. For about 2½ weeks after the first week of March, and again from around mid-September through the first week of October, West Quoddy Head gives the Sunrise County its bragging rights. Sutherland said he is unfazed. No matter where the sun rises first, Lubec is and always will the easternmost municipality in the continental U.S. And its scenery, he added, is terrific any time of year. 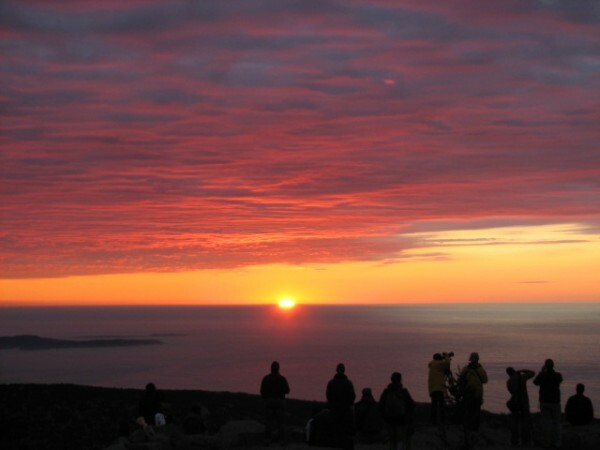 Len Bobinchock, deputy superintendent of Acadia National Park, said this past week that the height of Cadillac and its coastal location make it the first place in Maine where the sun appears between Oct. 7 and March 6, during which time the sun rises farther to the south. The mountain has no obstructions between it and the horizon, he said, aside from occasional fog. Bobinchock said Acadia posts information about Cadillac’s sunrise distinction on the park’s official website. But, he added, confusion over where it rises first probably is good for tourism businesses in the places that split the honor. For most tourists, the issue is academic, according to Bobinchock. Whether Cadillac is the first place in Maine where the sun rises each day or not, the sight from the summit “sure is” beautiful, he said. Brian Forman of Washington, D.C., was on top of Cadillac a few minutes before 7 a.m. Saturday to see the sunrise. He said he came to Acadia for a few days at the recommendation of the package delivery man at the office where he works. He agrees with Bobinchock on the quality of the view. Whether Saturday’s sunrise from Cadillac was the first in the U.S. doesn’t matter to Forman, he said. “I’m happy for everyone who is here who can see this,” he said. According to Bobinchock, the road to the top of Cadillac won’t be open all winter, so for those who do want to see the sun as it first reaches Maine, this is a good time of year to do it. The road will close by Dec. 1 if winter weather does not cause the park to do so earlier, he said. Peter Lord, an aerospace engineer and president of the Island Astronomy Institute on Mount Desert Island, said Friday that he hasn’t personally looked into where the sun first rises in Maine but that his understanding matches what others have said — that it shines first on Cadillac in the winter, on Mars Hill in the summer, and on West Quoddy Head around the spring and autumn equinoxes. Lord said that it wouldn’t be too tough to do a fairly scientific test of when and where the sun rises — an exercise he might try to get included next fall in the second annual Maine Starlight Festival. A group of people at various locations, each equipped with a cell phone and maybe a camera, might be all that is needed to sort it out as long as the weather cooperates, he said. If it does, he added, it would be enjoyable for everyone involved. “[The sunrise] is beautiful wherever you are. And it does move around,” Lord said.